Humorist and broadcaster Alan Coren has died aged 69 after suffering from cancer, the BBC has announced. He added: "Alan was the heartbeat of The News Quiz - the man around whom so much turned for nearly 30 years. Robert Thomson, editor of the Times, remembered Coren as "a witty and thoughtful tour guide through life". "Times readers found great inspiration in his irreverence and insight that will be cherished and rediscovered in decades to come," he added. 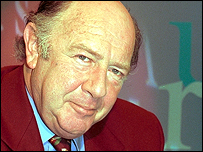 Journalist Francis Wheen, who appeared on The News Quiz with Coren, said he was shocked about his death. "It is very, very sad, and it has been quite sudden... he was diagnosed with cancer and declined quite quickly," Mr Wheen told BBC News 24. "It is a great loss because he was the only original surviving member of The News Quiz. "He had been doing it for more than a quarter of a century, and it is hard to imagine the programme without him." Comic Jeremy Hardy, who also featured on The News Quiz, described Coren as a "generous" performer. "He would have a flight of fancy and he never really knew where it was going, but it would always go somewhere brilliant and it would always end with a big laugh. "When I first came on the show he was a bit appalled that I was clearly a comic and clearly had gags, but we became very fond of each other over the years." Coren leaves a wife and two grown-up children - Giles and Vicky - who are both successful broadcasters and journalists.